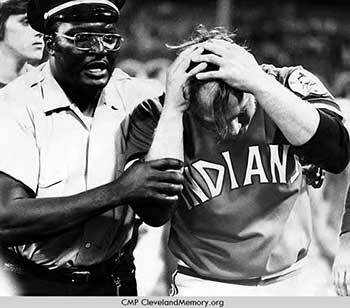 A security guard escorts Indians pitcher Tom Hilgendorf from the field after he was hit on the head with a folding chair. Established in 1901, the Cleveland Indians are a charter member of the American League. From the early days at League Park through the present day at Progressive Field, the Indians have taken part in nearly 9,000 major league games in that span. 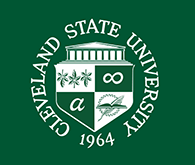 Cleveland has played host to the greatest players in the history of baseball, including Babe Ruth, Ted Williams, Mickey Mantle, and our own Bob Feller. Clevelanders have watched World Series games here, have seen perfect games pitched here, have seen fielders record unassisted triple plays here. Of all of those thousands of home games, one of the most famous -- and certainly the one which was the most infamous -- took place in Cleveland Municipal Stadium between the Indians and the Texas Rangers on Tuesday, June 4, 1974. That is a day which will forever live in infamy as Ten Cent Beer Night. The game is not remembered for the play on the field, but rather for the behavior and actions of a few hundred of the 25,000 fans in attendance, many of whom took full advantage of a special promotion enabling them to purchase beer for the low price of ten cents a cup. 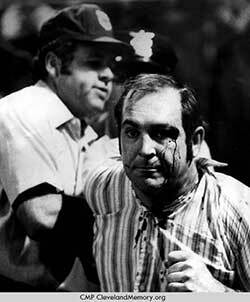 Umpire Joe Brinkman leads a bleeding fan off the field during the fan riot in the infamous "Ten Cent Beer Night." With no real restrictions on how many beers one person could buy at that price, many fans began to consume as much beer as they could hold. And perhaps bored with the game itself (the Rangers took an early lead and never trailed), many of these intoxicated fans began to misbehave. Some of them ran out onto the field, not always fully dressed. Others lit firecrackers in the stands, or threw projectiles, including bottles and full cups of beer, onto the field. Despite repeated pleas for civility and order by team officials over the public address system, the mayhem continued. In the ninth inning, with the score tied at 5-5 and the Indians at bat, one fan tried to steal the cap from the head of Rangers outfielder Jeff Burroughs. Angry and fearful for the safety of his players, Rangers manager Billy Martin led his team, some of whom were brandishing baseball bats, onto the field to defend themselves. In a show of solidarity, some Indians players came out to join them. But it was no use. Hundreds of fans stormed the field, and as the cliché goes, a melee ensued. Some fans took drunken pokes at Rangers players, at Indians players, and at one another. Indians pitcher Tom Hilgendorf was hit by a folding chair. When umpire Nestor Chylak was himself injured, he'd decided he'd seen enough, and declared the game forfeited to the Rangers. For a time, the Indians continued to hold promotions involving beer sold at a discount, but they placed and enforced restrictions on how much beer one person could buy, and became less tolerant of rowdy and intoxicated fans. Like it or not, the memory of Ten Cent Beer Night, like the flaming Cuyahoga River, has become and may forever be part of our city's legacy. See photos of Ten Cent Beer Night in Cleveland Memory. Posted 2014-05-22 10:40:52 by Lauren_Felder.